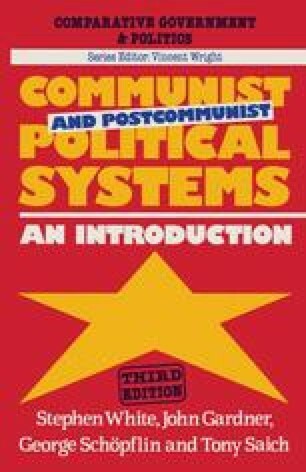 The formal structures of government — constitutions, legislatures and executives — have not normally been accorded much attention in the study of communist political systems. There are good reasons for this. In the first place, the electoral system has until recently been closely controlled in these countries and, although there is sometimes a choice of candidate or even of party in local or national elections, the whole process is closely controlled by the communist party and no candidates openly opposed to Marxist-Leninist principles have normally been allowed to stand. The legislatures to which the deputies are elected meet infrequently, their votes are normally unanimous, their legislative output is fairly meagre, and no direct challenge (again with some recent exceptions) is ever issued to the governments which are nominally responsible to them. The communist or ruling party normally provides a majority of deputies in these assemblies, its members constitute a party group or caucus which is expected to take a leading part in their proceedings, and party members, all of them subject to party discipline, dominate the key positions at all levels. Although there is some variety among them in terms of institutional form (see Table 3.1) and, as we shall see, in organisational effectiveness, it has been conventional, for reasons such as these, to regard communist legislatures as mere ‘rubber stamps’ and formal government structures more generally as of little consequence for the domestic political process.